Prime Minister of Ireland Taoiseach Enda Kenny last night ruled out a national vote on Irish unity saying the conditions for a referendum do not currently exist. His comments followed the formal acknowledgement by EU leaders of the possibility for Northern Ireland rejoining the EU as part of united Ireland post-Brexit. A statement in the minutes of the EU’s first official Brexit summit yesterday said that if Northern Ireland voted in favour of a united Ireland in future, then “the entire territory of such a united Ireland would thus be part of the European Union”. The text refers to the possibility for such a vote outlined in the 1998 Good Friday Agreement, and echoes statements made by UK Brexit secretary David Davis in a letter last month. Taoiseach Enda Kenny said the text was “hugely important in order to dispel any doubt or any uncertainty” but added that it did not mean a united Ireland was on the cards. “The only new thing here is Brexit and it’s important to provide reassurance that it does not undermine any provision of the Good Friday Agreement,” he told reporters in Brussels after the summit. However, Greece raised concerns that it could set a precedent for citizenship claims from non-EU citizens. 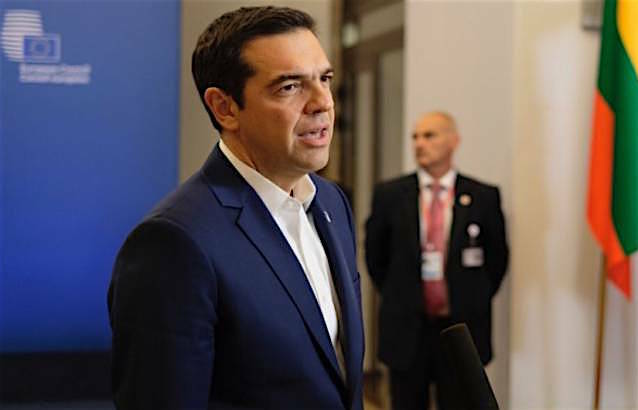 Greek Prime Minister Alexis Tsipras, who recognised that Ireland has a “special status” with the UK “that has to be maintained”, also asked for a clarification in the minutes that the Irish declaration did not “set a precedent for the relations of the EU with third countries”. His intervention was thought to refer to Turkish citizens living on the divided island of Cyprus, where reunification talks have hit another impasse. The united Ireland statement is not part of the EU’s official Brexit negotiating stance, which is contained in a nine-page document approved unanimously, without discussion yesterday. In it, leaders took what European Council president Donald Tusk described as a “firm and fair” stance, with red lines on citizens’ rights, a financial settlement and the Irish border. They say progress on those three issues is essential before talks can begin on a post-Brexit trade deal with the UK. Citizens’ rights are the bloc’s first priority, with leaders calling for “real guarantees” for people to work, live and study after Brexit. “In order to achieve sufficient progress, we need a serious British response,” Mr. Tusk said. The UK will be handed a single bill covering its remaining financial obligations to the EU, and while no figure has yet been agreed, Dutch Prime Minister Mark Rutte said it would be “substantial”. French President Francois Hollande said there must be “a price and a cost” for the United Kingdom leaving the bloc, which, behind closed doors, has been estimated at around €60bn. “It shouldn’t be punitive, but at the same time it’s clear Europe will defend its interests, and that the UK will have a worse position, tomorrow, outside Europe than it does, today, within Europe,” Mr. Hollande said. The comments are likely to further antagonise British Prime Minister Theresa May, who accused the bloc of “lining up against” the UK ahead of the talks. “The fact that the EU speaks in one voice is the most natural thing in the world. We are not ganging up on Britain,” said German Chancellor Angela Merkel. The EU’s negotiating guidelines also say the Good Friday Agreement should be maintained “in all its parts” and that there should be no return to a hard border on the island of Ireland. It refers to the need for “creative and imaginative solutions” to ensure that no militarised customs post or long queues ensue as a result of Brexit. “It won’t all be as calm and as measured as today,” Mr. Kenny said of future talks.